Hiking Taraw Cliff - Life is so full of tae! I think scaling mountains on our anniversary is an unspoken thing. It's never in our intention to hike every anniversary, but it happens all the time. I guess, part of it is the need to pause from climbing the corporate ladder and have a breather. Another part is simply because we have always been in constant search for adventure and we love doing offbeat things together. 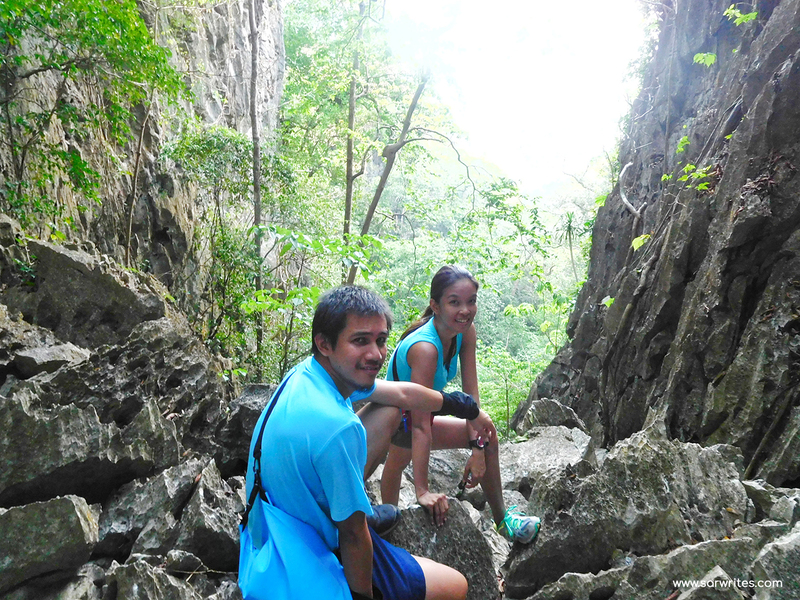 So for our third anniversary, Jan and I conquered El Nido's highest, the Taraw Cliff. I would say we are truly blessed that we don't have to go too far to experience one of the world's greatest wonders. 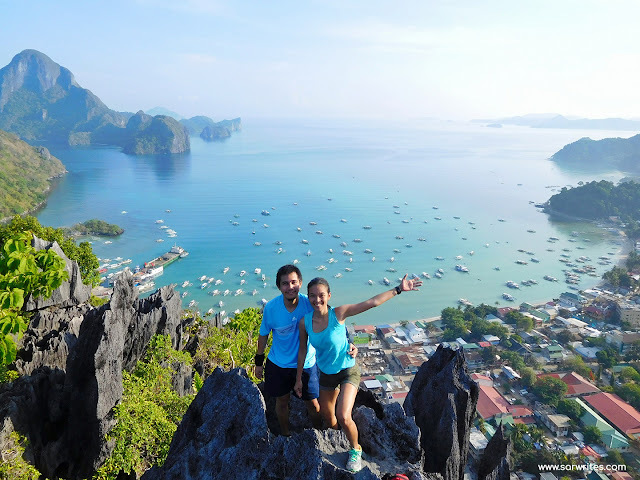 I am so grateful to have experienced El Nido first hand (and with the one I love). And to see such magnificence from a bird's eye view made us so alive. However, getting there is quite an ordeal (as what I've heard from a first-time climber). But for us who have been through worse, I wouldn't say it was difficult. I wouldn't say it's easy either. 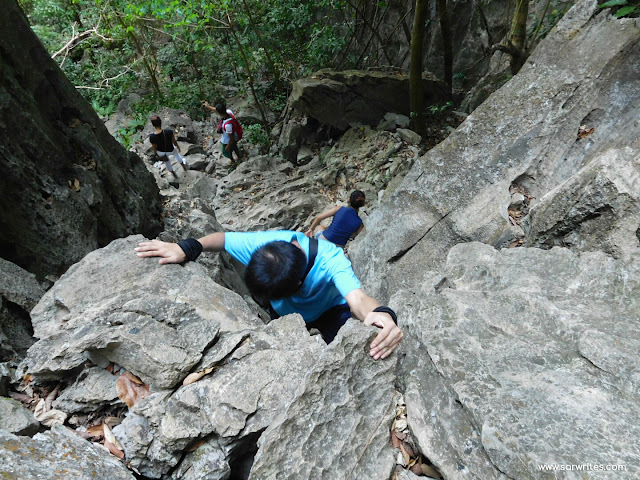 But climbing it is no joke. It requires extra extra caution because you'll be surrounded with rocks with sharp and pointed edges. One wrong move could cost your life. And I am not exaggerating. We started hiking at around 6AM. Should you wish to catch the sunrise, start before 5AM and make sure you have headlamps with you. We hired a guide for Php 500 and went on our way through steep ascents and sharp boulders. Since rock and wall climbing isn't new to us, it was easy for us to navigate through those 90-degree walls. 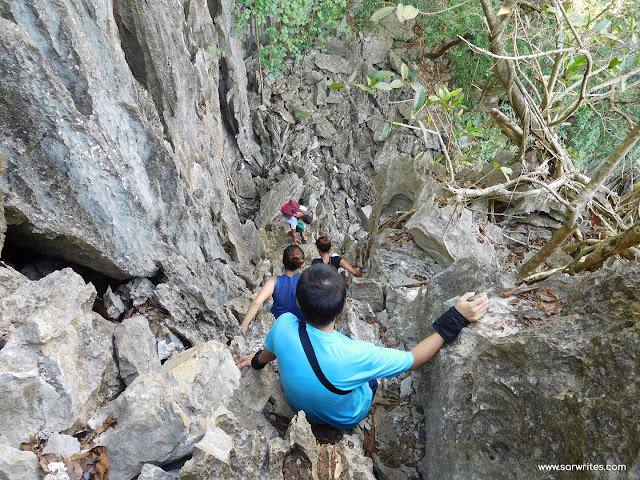 On an average, hiking Taraw Cliff takes a little more than an hour. With our pace, we could make it in half an hour. But since there were two newbies who went with us, we slowed down and guided them through, teaching them where to step, what to hold, and always reminding them to just enjoy the activity and take their time. And that is what I like about hiking. You get to meet new friends and you learn from each other. It was fun sharing with them our hiking experiences, and most importantly, imparting them the principles of Leave No Trace. 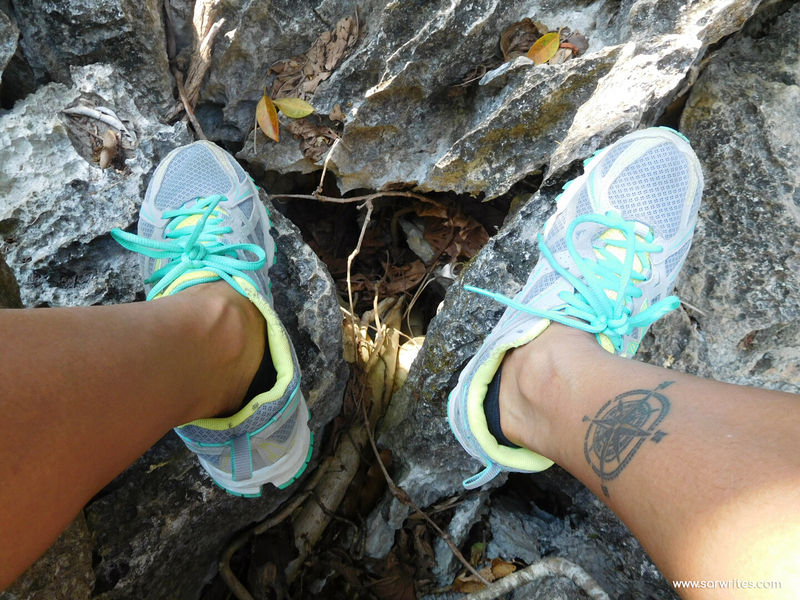 And of course, hiking isn't just all about reaching the top. Sometimes we'd pause on our tracks, breathe fresh air, and enjoy the scenery - something we don't experience everyday. And despite being with first time climbers, we reached the peak sooner than expected. 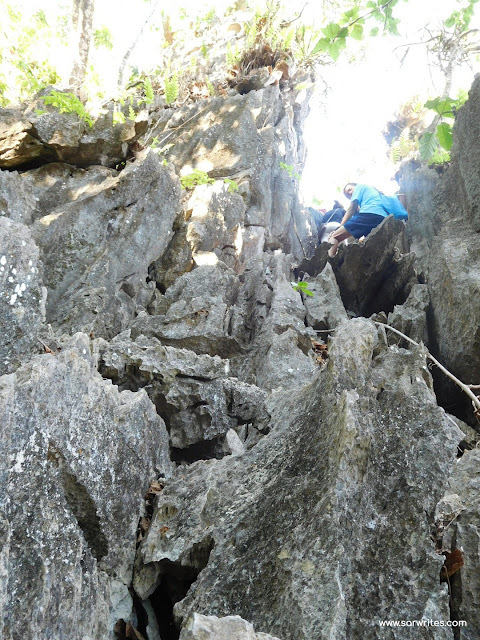 It took us an hour of treading sharp rocks, kissing the wall, and asking "ito-na-ba-ang-huling-mahirap-na-parte-kuya?" to be able to marvel at this beauty. And it was definitely worth it! 1. Wear shoes. You've seen the photos, I don't think I need to explain further. 2. Bring water. And please DON'T LEAVE YOUR BOTTLES OR ANYTHING BEHIND. 3. If you wish to bring a bag, use a backpack and keep it snug/tight on your back. As much as possible keep your hands free. You need both of your hands to climb the rocks. 4. The best time to climb is early morning. Otherwise, you will have to bear the piercing heat of the sun. 5. Take your time (hindi aalis yung peak). 6. The descent is more difficult than the ascent. So again, take your time. 7. 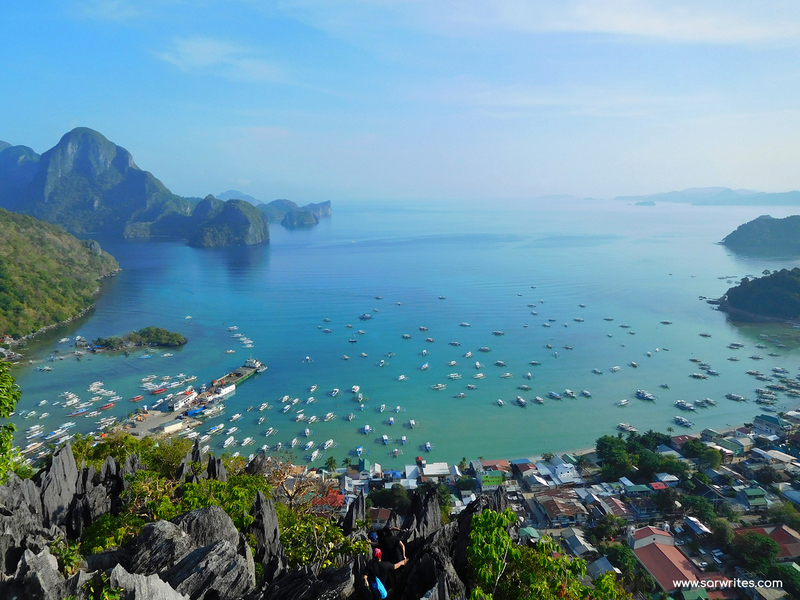 If you need to find a guide, head over to street corner of Midtown El Nido Bakery and simply just ask the locals there. I'm not really into hiking but I can tell how awesome that experience must have been for you guys. The view is really breathtaking! Would love to go to El Nido soon. I think I'm not fit to go on a hike. I envy you for being able to do this and see things that many people will never get to see. Happy anniversary. This is very challenging yet very rewarding. Lucky you to witness such nature's beauty. I wish I can do it in the future. I need to be fitter I guess, hehe.